The sophistication of the civilization's agricultural systems rivalled their pyramids. The ancient Maya civilization is widely recognized for its awe-inspiring pyramids, sophisticated mathematics and advanced written language. But research is revealing that the complexity of Maya agricultural systems is likely to have rivalled that of their architecture and intellect. 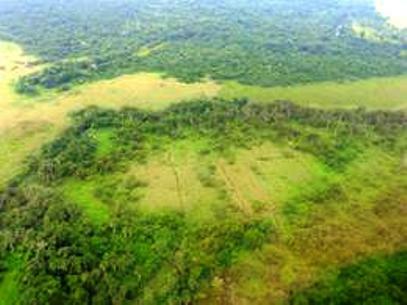 Using new techniques and extensive excavations, researchers have found that the Maya coped with tough environmental conditions by developing ingenious methods to grow crops in wetland areas. "The work shows that this intensive agriculture is more complicated and on a par with these other areas of intellectual development," says Timothy Beach, a physical geographer at Georgetown University in Washington DC, who presented his findings on Wednesday at the Geological Society of America (GSA) meeting in Denver, Colorado. The Maya civilization, considered one of the most advanced ancient societies, lived in sprawling and densely populated pockets from the Yucatán Peninsula in southeastern Mexico to Honduras in Central America. The civilization arose before 1000 BC and reached its height from about 400 BC to 900 AD. The Maya's home was a tough environment replete with recurring droughts and rising sea levels, and the land that they farmed was rough, rocky terrain interixed with vast swamps, or wetlands. So one of historians' biggest questions about the Maya civilization is how they managed to feed their huge populations. It has long been suspected that the Maya relied heavily on agriculture. In the 1970s, researchers began characterizing the remains of elaborate irrigation canals found in wetland areas. But it has not been clear how widespread these canals were or whether the use of wetlands for farming was an important part of the Maya agricultural system. At the GSA meeting, Beach presented the results of two decades' work aimed at answering these questions1,2. During that time, he and his wife, Sheryl Luzzadder-Beach, a physical geographer specializing in water quality from George Mason University in Fairfax, Virginia, and their colleagues, have performed more than 60 excavations to study and map the different earth layers, or strata, in field sites in northern Belize. Working in low-lying wetlands, which are difficult to access and navigate, the team dug trenches some 3 metres deep and 10–20 metres long to study soil and water chemistry. They performed carbon-isotope analyses on soil layers and studied fossilized plant materials to work out how the land was used. The soil layers revealed signs of rising water tables and the remnants of flood deposits. Fossilized plant remains at these sites show that the Maya were growing crops such as avocados, grass species and maize. Their research suggests that the Maya built canals between wetlands to divert water and create new farmland, says Beach. As the Maya mucked out the ditches, they would have tossed the soil onto the adjacent land, creating elevated fields which would kept the root systems of their crops above the waterlogged soil, while allowing access to the irrigation water. Beach says that surveys carried out using Google Earth and remote sensing techniques suggest that this wetland system was probably around 100 kilometres across. Although about 40% of the Yucatán Peninsula is swamp today, the idea that the Maya farmed wetland areas extensively has been controversial among archaeologists. But the new work is "very suggestive that the Maya were modifying these swamps intensively to make a living", says Vernon Scarborough, an anthropological archaeologist at the University of Cincinnati in Ohio, who was not involved with the research. "It's hard to project across the entirety of every swamp area because there are so many of them. But it's certainly intriguing." Stephen Houston, an expert on Maya civilization at Brown University in Providence, Rhode Island, who recently began collaborating with Beach, says that because so much archaeological work on the Maya civilization has focused on its architecture and written records, relatively little attention has been given to understanding its agriculture. "Usually in archaeology there's an elite focus on the majestic cities that we can wonder at," says Houston. "But the burning question is always how did they feed these populations." Beach's arduous excavations have filled "a crucial gap", he adds. "They've confirmed that many of these swamplands in that area were being used for that kind of intensive agriculture and large-scale manipulations of the landscape." One of the reasons some scholars dismissed the idea that wetlands were fundamentally important to the Maya is that they are often far from famous sites such as Tikal and Chichen Itza. But there must have been dense populations living in rural areas near wetlands, far from the glitzy urban centres, says Beach. "It's a very thoughtful, clever way of utilizing the environment," says Scarborough. "When a Westerner goes into a wetland today, they see nothing but trouble. It's difficult to tame, capture and modify. But in the past they were considered real breadbaskets in many parts of the world." Beach, T. et al. Catena advance online publication doi:10.1016/j.catena.2010.08.014 (2010). Beach, T. et al. Quat. Sci. Rev. 28, 1710-1724 (2009).